Currently, negotiations are being carried out in secret to create the largest free trade area in the world, ostensibly as a path to stronger economic recovery after the financial crisis. The emphasis is not so much the removal of tariff barriers, but to promote deregulation: removing barriers that could stand in the way of international corporate interests, such as any laws protecting labour rights, the environment, food standards, consumer rights and the tentative regulations governing the banks, which caused this economic crisis in the first place! 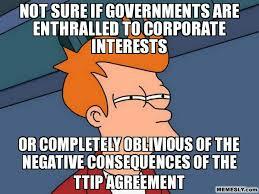 TTIP will affect directly and immediately not only our individual health, the safety of our food and environment and our democratic rights, but will do away with the social achievements fought for and won by the trade union movement for generations. This is an assault on what many organisations have struggled for in order to create a fair and just society .Democratically elected governments would virtually be giving up their sovereignty. Regulation of greenhouse gas emissions (challenging the EU’s commitments under the Kyoto Protocol). Food Safety potentially allowing GM foods, poultry that has been treated with chlorine, and weakening controls on endocrine disruptors (chemicals known to interfere with the human hormone system) . Green Party policy is public ownership of rail. East Coast mainline, which has been run by the state for the past few years, gave a practical way of showing support. Action for Rail, We Own It, Bring Back British Rail and Friends of Suburban Bristol Railways (FOSBR) demonstrated this outside Kings Cross Station and Bristol Temple Meads on Friday 7 March 2014. Campaigning against fare increases is due on Tuesday 19 August. Friday 24 October is the second reading of the Railways Bill presented by Caroline Lucas, Green MP for Brighton Pavilion. The new franchise will seriously affect passengers and employees on the Thameslink, Southern and Great Northern network. On Tuesday 21 October, the ‘Freedom Riders’ will appear in a Sheffield Magistrates Court facing charges for defending their free rail travel. Hopefully Bristol rail campaigners will show support on a local station. FOSBR Campaigns Organiser, one of the ON TRACK columnists in the Bristol Post and member of the Green Party. With nearly 4000 members the Green Left Face Book site is an open group for people on the left to discuss campaigns, post items of interests and also discuss ways forward in a positive manner for the green and socialist movement including the need for eco socialist policies and action. VISIT THE GREEN LEFT FACEBOOK SITE! Just type ‘Green Left’ in the search bar. NUKES: JUST TOO DANGEROUS OR A NECESSARY EVIL? Many members joined the Green Party in part because of our anti-nuclear power policy. Our 2010 manifesto argued that nuclear power was not the answer. The case against nuclear is even stronger today, after Fukushima. Nuclear power is far too risky, if a nuclear disaster can happen, it will happen. Fukushima happened, despite the technological prowess of Japan, their expertise in earthquake defence and awareness of radiation hazards from Hiroshima and Nagasaki. Nuclear power has always been linked with nuclear weapons, it still is. The dangers of nuclear proliferation, and the threat of terrorism, are real. Nuclear power is pushed by the powerful aggressive lobbying of the nuclear industry, interested in taking the profits then walking away from the costly painstaking decommissioning problems. Nuclear power is not economically viable if fully costed. The timescale for new build is far too long. Relaxed safety requirements to prolong existing reactor life are unacceptable. There is no solution for radioactive waste disposal, it will be a millstone legacy for many generations and tens of thousands of years. If the Romans had nuclear power, we would still be guarding the waste. Nuclear power is highly centralised power generation, against the Green Party principles around localism. Nuclear is not carbon-neutral. To opt for a mix of nuclear and renewables, even in a period of transition, is a dangerous and unnecessary distraction from the energy policy we need. We can get all the energy we need from renewables. We have the correct policy on nuclear power, to change it would be foolish. Just to begin with, I want to be clear that I’m academically neutral on the subject of nuclear power. My interest is purely in how to achieve a 100% renewable energy supply as soon as possible, because I know that's by far the most important thing we need to do to combat climate change. Like it or not, nuclear isn't a black and white issue and, practically speaking, if the Green Party came to power at the next election it would be virtually impossible to go nuclear free in one term. If you look at the progress on Germany's energiewende they're still a long way from meeting the electricity supply losses from all nuclear build with renewables - leaving a choice of importing dirty coal electricity from the east or nuclear electricity from France. The question of whether nuclear helps or hinders renewables is very complicated. Probably the ideal pathway to 100% renewables is ramping up capacity and ensuring all non-renewable new build is a mix of gas CCGTs (combined cycle gas turbines), as much biomass as is sustainable and a few other large scale renewable / low carbon techs that currently at near-zero capacity. How long that'd take basically depends on how much and we're talking big chunks of GDP to go there fast); how quickly it can be brought online and how much additional renewable build we'd need to cover back up capacity Take energy efficiency and (critically) demand reduction as read,. An alternative scenario is accepting a bit of nuclear but then only renewables as well. a 20-30/70-80 nuclear / renewables mix as a stepping stone to 100% renewables The problem with this is that CCGTs work very well with renewables because they can go on or offline in hours as supply and demand rises and falls, but nuclear needs days to cycle up and down. However, I certainly wouldn't rule out a 'nuclear and renewables only' solution with the right mix of renewables, but for the foreseeable future by 'renewables' we mean 'mainly wind'. Wind should certainly be central to our renewable energy future but much more generation from more predictable and less intermittent renewables (e.g. tidal, marine, and anaerobic digestion) is needed to overcome its drawbacks. However, as it is, is it not better to accept that we all agree 100% renewables is the goal I may be wrong, but I do think the benefits of an anti-nuclear line out weight the costs, but only if we are honest about the practicalities of achieving it, which may be very uncomfortable for some members. That said, I do think some of the risks of nuclear are overstated compared to the likely impacts of climate change, and that its impacts have been overplayed when compared to coal, and probably fracking. So yes, I am prepared to take a chunk of nuclear because at the moment it's preferable to many of the likely alternatives. I have no problem being a member of an anti-nuclear party because ultimately we all want to get rid of it, but I do think that the party needs to be realistic about the fact that if it came to power tomorrow it would not be able to eliminate nuclear from our energy mix in one term, at least. And when the party does take power it should also be prepared to consider whether or not it would actually be advisable to do so - and that will depend on quite how badly those in power screw things up in the meantime. Q. Caroline Lucas and Molly Scott-Cato drew a good crowd when they visited Hinkley recently. But both the government and the local authorities here in Somerset act as if a new nuclear power station is a certainty and many local people accept this. What can we do? A. Vote Green. They are the only party in the UK against nuclear power. We must also lobby both our MPs and MEPs as they are the decision makers. We can talk to the public as well and make them aware of the issues. We should be having this conversation with as many people as we can. To support the Stop Hinkley campaign visit www.stophinkley.org The website is a useful resource to keep you up to date with current issues, as well as offering the option to donate and become a member. Q. Is Hinkley Point a suitable site for a Nuclear Power station? A. No. The future rising of sea levels and the coastal erosion due to climate change makes Hinkley Point a vulnerable site. There was a tsunami in 1607 that caused devastation as the sea engulfed Hinkley Point and reached as far inland as Glastonbury. It could happen again. Q. Will Hinkley C fill the energy gap? A. No. It will never be built in time to replace the electricity lost as the old nuclear power stations come off line. The two European versions of EdF’s reactor design are up to nine years behind schedule and may never be finished. This reactor design is not yet running anywhere in the world. Renewables could produce the same amount of energy in less time and at a fraction of the cost. Q. We have been generating nuclear waste in the UK since 1956. What facilities do we have for the safe and secure long term storage of nuclear waste? A. None! Q. Is Nuclear Power cost effective? A. No. Nuclear power has been totally subsidised for 50 years by the tax payers, with never ending costs. The present Government wants to give further subsidies, which are being investigated by the EU later this year. Q. What is the total financial cost of nuclear power? A. Nobody knows yet. We won’t know until the final bill for decommissioning and keeping the hazardous waste safe and secure is totted up at some date thousands of years into the future. As the costs escalate, standards will slip and accidents are inevitable. Nuclear power is a poor investment for the future. Q. What are the other costs of Nuclear Power? A. There are incalculable costs in ill-health, environmental contamination and damage, which is a huge cost for the future generations to have to carry. Continuing pollution of our environment is unfolding with every release of radiation, both accidental and licensed. Q. The judge deciding in a recent An taisce (Irish National Trust) challenge had been advised that the risk of a nuclear accident was very small. Would you agree? A. Just look at the numbers. In the last 35 years there have been 3 major accidents leading to meltdowns and nuclear disasters at Three Mile Island, Chernobyl and Fukushima as well as many smaller incidents that have been reported, let alone the ones that have not been reported under less open regimes. Q. How secure is Nuclear Power? A. Nuclear Power represents a high security risk as a terrorist can target both the waste stored and the waste transported on trains and lorries through our towns and cities. Our biggest national security threat is from terrorists targeting nuclear facilities and nuclear waste. One of the populist slogans of neo-liberalism is ‘choice’ often contrasted with the lack of choice in state provided (they say ‘controlled’) education, health and social services. Large-scale collective provision in the past was often unresponsive to individual needs with unnecessary rules and alienating procedures (I remember my mother being frustrated at having to get council permission to decorate her council bungalow). Back in the 1980s defending local services from cuts our local campaign recognised that they were not perfect with the slogan, ‘Defend our services – fight for services worth defending’. Greens have tried to address that issue in our education policy by supporting the role of democratically accountable local authorities in school provision while also supporting diversity of educational approaches within that provision and a curriculum responsive to local needs. “To make it perfectly clear that judgemental interference by the LA is not acceptable and make it clear to Home Educators that the offer of support is there but optional. There is no need for the LA to be responsible for ensuring HE children receive ‘a broad and diverse education of high quality”. When I joined the Green Party back in 2008 I asked about the Green Party’s view of the state. I was told, ‘We speak truth to power’. Pursuing the question on various occasions it was clear that people were wary of any heavy 70s style discussion of ‘the state’ but it does seem to be the elephant in the room in terms of our policy making. The initial division at a simplified level is between those who see the state as an enabler, able to deliver progressive social policies, even if it does not do so at present, and those who see it as by nature oppressive and controlling. Within the party there are differing emphases on individual, community and large-scale collective solutions to the problems we face. Divisions are apparent in our assumptions about the role of the ‘local state’ in the form of local councils, and the role of big and small businesses, nationalised industries, co-operatives, community groups and voluntary organisations. In the Energy Policy (B1) motion there is clearly a tension between the large-scale solutions requiring state planning and financing and ‘localist’ democratically controlled initiatives. Does the seriousness of the climate crisis mean the former takes priority over the latter? Would the Greens use state power to impose such solutions? In what seems to be blithe disregard of the power of global finance and capitalism the Industry and Jobs policy motion (B2) states: ‘Therefore markets should have a role as servants to society (but not owners and masters). Trades Unions, Cooperatives and community ownership all have a role in democratising control over production and socially aware entrepreneurship can bring about benign change’. How does that sit with Green Party policy on the renationalisation of the railway if the market still has a role? Doesn’t opposition from a vociferous market mean ‘benign change’ will fail unless there is considerable state muscle behind it? On July 10th hundreds of thousands of public sector workers went on strike over pay, conditions and pensions. The Green Party sent letters of solidarity to the trade unions involved, and released statements of support to the media. For some, this brought up complex issues. Most of the major strikes in recent years have been in the public sector, which – although centralised and hierarchical – is essentially a set of not-for-profit organisations working broadly for the common good. This feels a bit at odds with the ideology surrounding strikes, and it muddles the mechanisms for making them effective. In a private company with profit-hungry owners, a strike means a day of lost profits and a potential loss of long-term customers who want reliable service. As the company exists alongside other providers, customers can still get what they need – it is the company owners that suffer the loss. For the public sector it’s rather different. There are no profits to be lost; instead it is the public that loses services. These ‘customers’ can’t take their business elsewhere. A government that is not particularly fussed about providing decent public services might not be too concerned that the public will lose out. Meanwhile, an elite-owned media can frame the issue as a case of bolshy workers rather than bad government, so the reputational loss is borne by the workers movement rather than by the political party in power. This is what we’re up against as we resist the destruction of the public sector. While strikes are still a crucial tool in our armoury, we need to consider if there are other ways of hitting bad governments where it hurts. A teacher friend of mine had an interesting idea: a campaign of indefinite work-to-rule. Teachers would still turn up to school and provide high-quality lessons, mark children’s work, and look after their well-being. But they would not go to staff meetings, or reply to management emails. They would not submit lesson plans for approval, co-operate with performance assessments, or do any ‘box-ticking’. In this scenario, kids would still get educated, and their parents could still go to work. But the government’s initiatives would fizzle out; their attempts to control schools and teachers would come to nothing. Spread across the public sector, everyday services for the public would continue, but the government would be shown up as incapable of implementing their policies. As public opinion tends to be hostile to ‘bureaucracy’ anyway, this sort of action might attract a lot of support. This could scare bad governments into reversing cuts, or even persuade the public to elect better governments that have alternatives to austerity. The law surrounding work-to-rule is vague, and this kind of industrial action would no doubt be vilified and penalised by most governments. But given that strikes already suffer this treatment, and may not always achieve their desired effects, now could be a good time to start thinking outside the box. We need to sharpen the tools in our armoury if we’re going to win the fight against cuts and preserve and support a decent public sector. 1989 THE HIGH WATERMARK? WHAT ABOUT 2015? The European Elections of 1989 still stand as the high watermark of the Green Party`s electoral fortunes. As the election was First Past The Post, even a 15% share of the national vote failed to secure a single seat - although over two and a quarter million people voted Green. There was a clear regional divide. Most seats in the South and South West had a 20% - 23% Green vote as against 10% - 12% in the Labour heartlands. This was seen as a historic breakthrough which caused a short lived media sensation and an influx of new members which the small party struggled to cope with. The Green surge in 1989 had a very specific context which is unlikely to be repeated. The party had a clear field then to harvest most of the “none of the above” vote which at the recent Euros went to UKIP. On the other hand the party did not have the capacity to capitalise on its electoral success. As far as the wider public were concerned the Greens were a one issue party who got lucky, benefited from a mid-term protest vote and faded away again. The 2015 General Election will be fought in the context of a big change in the political weather. The three main parties now share the same neo-liberal agenda and the “none of the above” vote has risen to 30% in recent polls. The one and a quarter million people who have just voted Green in the Euros have mostly voted Green before, many of them on multiple occasions. The Green Party can now be said to have “a base” and one which is increasing along with a rapid rise in membership. With a few notable exceptions past general elections have brought disappointment. After the 2009 Euro-elections our support dropped back to less than 4% within three months. This time 8% say they intend to vote Green in 2015. A result anywhere close to this would mean a step change in public perceptions and future voting intentions; and the party would become more of a pole of attraction for young people and those in the movements against austerity, fracking etc..
We have the radical policies for social justice and a fairer society on a sustainable planet and surveys show that 25% of people agree with us on the key issues. At the General Election in 2015 we will asking, or challenging, them to “Vote For What You Believe In” for a change. The Green Party is very much coming of age politically and being faced with bigger challenges but opportunity is definitely knocking again. A placard I once designed for the KUWG says: “We're more angry than frightened.” State oppression uses state broadcasting and nasty profiteering companies such as Atos, Crapita, and Maximus against us along with intimidation and 'witch hunts' as tactics to make us cower. Disability hate crime has been on the increase along with encouragement from Government for people to suspect and report on supposedly fraudulent disability benefit claimants. Against this backdrop, are the deaths of people denied the benefits they should have been entitled to justified by the supposed need to clamp down on fraud by benefit claimants? Thus many claimants are afraid of standing out publicly and using their abilities for fear of being deemed 'fit for work' or 'not disabled enough' or 'spending too much time campaigning and not enough time job-seeking'. Similarly, the attacks experienced by economically vulnerable people in the UK cannot be laid at the doors of just one political party, and stem from such thefts by the wealthy from the poor as the Inclosures Acts by which dispossessed people became more dependent upon being available to 'the labour market' and 'the market economy' for food and shelter. Beyond the Inclosures Acts, there was the privatisation of public utilities in the 1980s, and there has also been the impact of 'Right to Buy' policies with very intense subsidies from Central Government, to the detriment of truly social housing and the maniacal glee of the global wealthy. And now, of course, a Government with no mandate for fracking, wants to sell licenses to global companies to add to global warming and undermine our roots to the land. The 2003 invasion of Iraq led to the death of millions and chaos in the region. Jihadism nurtured by both Saudi Arabia and starting in Afghanistan in the 1980s by the USA as a force against the left, has flowered into a killing machine in Iraq and Syria. Using US weapons ISIS in Iraq have assaulted the population, against with particular violence against Shias, Christians and Yizadhis. How should the left react? Cheering on renewed US and British intervention is wrong, a root cause of the current horrifying situation is such intervention. In a complex situation I think it is clear that we should give practical solidarity to Rojava. Perhaps you haven't heard of Rojava. It is the Kurdish region of Syria. Rojava is both newly autonomous and proud socialist, so no wonder it isn't in the news. A society that embraces religious and other forms of diversity, it has also been the most successful force in the region in opposing ISIS and other murderous fundamentalist forces. Some see Rojava as a Chiapas of the Middle East. This is in reference to the Zapatists who revolting against neo-liberalism and assaults on indigenous people in Mexico, created their own liberated region. I am not in any position to judge this and we should beware make statements of dogmatic certainty for the far away UK. However it is clear that we should give Rojava solidarity, there are perhaps a million refugees in Rojava. We should also educated ourselves as to their work, learn more and support where we can. An appeal in support of Rojava can be found following this link. These are my personal reflections on meetings I have attended, in Brussels and London, of the new European Ecosocialist Action Network. EEAN was established in 2013, for the organisation of common actions, sharing information and experiences, and to develop ecosocialist proposals across Europe. My first meeting was the follow-up meeting held in Brussels in March which I attended with Jane Ennis of Green Left. There was participation from Europe with delegates from Poland, Hungary, Bohemia and Moravia, Italy, Spain, Greece, Belgium, UK, France and Germany. 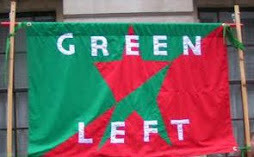 From the UK, Green Left, Left Unity, Alliance for Green Socialism and Socialist Resistance were represented. The first session in Brussels was a roundtable discussion, with contributions from all delegates, followed by a debate on forms of possible direct action across Europe. A technical secretariat was established for drafting work on the founding statement. The afternoon session comprised invited contributions and questions. Delegates were addressed by Michael Lowy who argued that ‘It’s a worldwide struggle, with a common enemy, the global companies that affect us all. There is a clash of cultures between indigenous people and the relentless pursuit of capitalist growth....’ Isabelle Vanhiel, presented a valuable detailed account of the legal tools to confront multinational companies. Rene Fernandes, the Bolivian Ambassador to the EU welcomed the formation of EEAN. The session concluded with an inspirational speech by Jean-Luc Melenchon MEP. There were diverging viewpoints and differing priorities and agendas among so many European countries. There was a commitment to share experiences, learn and find common solutions. This diversity is a major strength of EEAN. The successful beginning owes much too many individuals, not least Francois Ralle Andreoli, Romayne Phoenix, Stephen Bouquin and Sylvain Savier. I was able to attend the first day of the next EEAN meeting held in London in June. It was an opportunity to renew personal contacts. The principal outcomes were: the founding statement of EEAN, a campaigning blueprint ‘Green Energy for All’, and a set of organisational guidelines. The next EEAN meeting is planned for Barcelona. In my view this new network holds much promise for the development of Ecosocialism in Europe and beyond. Globalisation, (or to name it properly Global Capitalism), impacts on all aspects of human life, across the planet. Perhaps the most damaging manifestation of this is in relation to food- how and where it is produced and the extent to which the need to provide nutritious food for humanity on a sustainable basis is undermined by the profit motives of some of the world's largest and greediest corporations. In 2009 the UN estimated that 850 million people were chronically undernourished, lacking enough daily food to sustain a minimally healthy life. In the same year, against a backdrop of a severe economic crisis (a crisis of global capitalism) contributions to the World Food Programme hit a 20 year low. By 2012 2.5 billion people were considered to have an insufficient food intake. Most of them were the rural poor. The danger of food shortages has been exacerbated by- growing meat consumption, agro fuel production, climate change, and the damaging effects of modern agricultural and fishing methods. Around 40 transnational corporations control the global food regime, amassing spectacular profits in doing so. However the majority of staple crops which feed the world are still grown not by transnational corporations but by farmers using traditional methods. (400 million of the world's 525 million farms are small farms- less than two hectares). And contrary to " popular belief " ( what global capitalism wants us to believe) these small holdings have higher yields than large plantation based farms and greater potential for poverty reduction, as well as reduced greenhouse gas emissions, as confirmed in a recent report by the retiring UN Special Rapporteur on the right to food (and ecosocialist ?) Olivier De Schutter. As their mothers wail and our memories rust.